The weather forecast spoke of sunny spells breaking out on Sunday and, as one of the things on my “to do” list this Odonata season was “visit Wicken Fen”, down came the Mazda’s roof and off we sped. The cloud looked pretty solid as we tried out the new Sally-Satnav-confusing road to Bedford (she thinks you’ve gone off piste into Farmer Giles’ turnip field, so we left her turned off). We continued on to Cambridge and so did the cloud, which continued to look pretty solid. At Cambridge we woke Sally up and let her talk us down through the continuing solid cloud cover to an instrument landing at our destination car park between the village of Wicken and the National Nature Reserve itself. Wicken Fen NNR is run by the National Trust, as is the car park. Carol is a member of the National Trust which would have waived the £2 parking fee, except that her parking sticker was in our other car. Whoops, didn’t think of that! Actually, since there was to be a £5.99 admission fee to the reserve for me, a non-member, I was rather surprised that there was also a car park charge at all. No matter, a few dragonflies are worth a couple of quid –well, £7.99 in all. The unbroken cloud followed us into the reserve where, as usual on admission to NT properties, I had to fend off the chance to save my £5.99 admission if I joined the NT for ~£40 annually. “No thanks, I find rich folks’ big houses uninteresting and, besides, they make me jealous”. I can see why I relate to dragonflies so much. Dragonflies and I share a similar definition of good weather. Unlike most Brits, who describe weather as “oh, isn’t it nice?” if it simply isn’t raining, I reserve such descriptions for days when the sun puts in an appearance. Thus far it hadn’t and neither had the dragonflies. Wicken Fen is supposedly one of the prime spots for dragon hunters in the UK and, having wandered half way around Sedge Fen, we’d spotted but one shy Ruddy Darter (Sympetrum sanguineum). We did then find a small water channel with a little more activity – a Brown Hawker (Aeshna grandis) was ovipositing and a Migrant Hawker (Aeshna mixta) was flying up and down over a Blue-tailed Damselfly (Ischnura elegans) enjoying lunch but it wasn’t what you’d call humming with activity. We could see what appeared to be a large, approaching sunny spell in the south-western distance so we decided to take a leaf of the little damselfly’s book and repair to lunch in the hope that the blue sky would get to us. 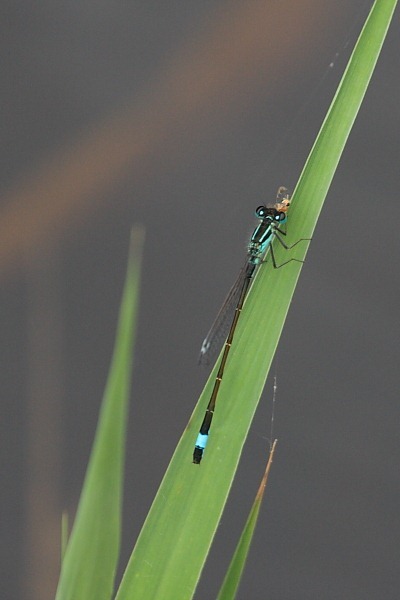 I had noticed that Wicken Fen has a population of the curiously named Variable Damselflies (Coenagrion pulchellum). They don’t look particularly exciting, once again being “just another blue dam”, but they are different and less than widespread. We are also getting perilously close to the end of their flight season but I was hoping to see my first. Eventually, about another hour after lunch, the sunny spell did stagger its way to Wicken and the sun came out. So did the dragons. 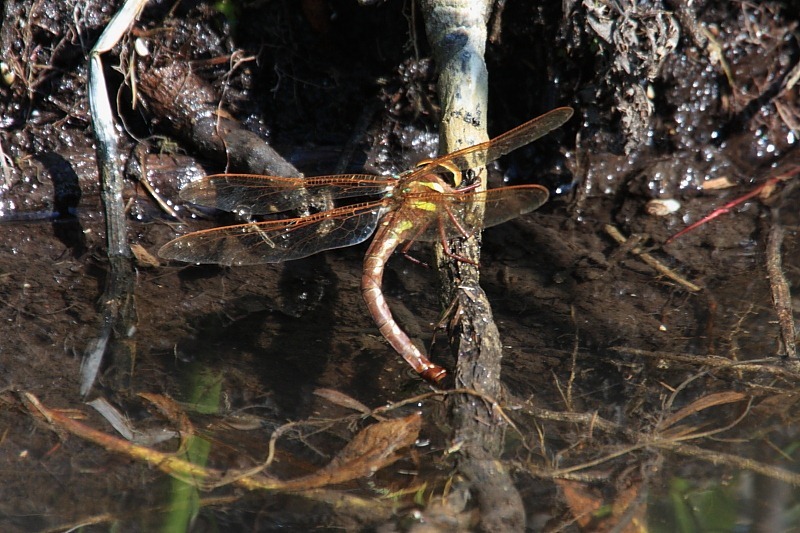 No sooner had the sun appeared than we started seeing tandem pairs mating and masses of Brown Hawkers ovipositing. Ever the opportunists. 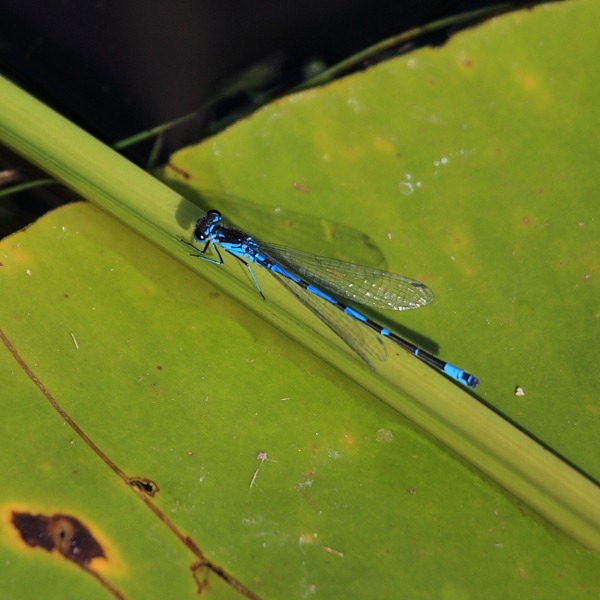 We began another circuit of Sedge Fen and hawk-eyes spotted a blue damselfly on a lily pad. ”I think it’s an Azure”, she said studying it. 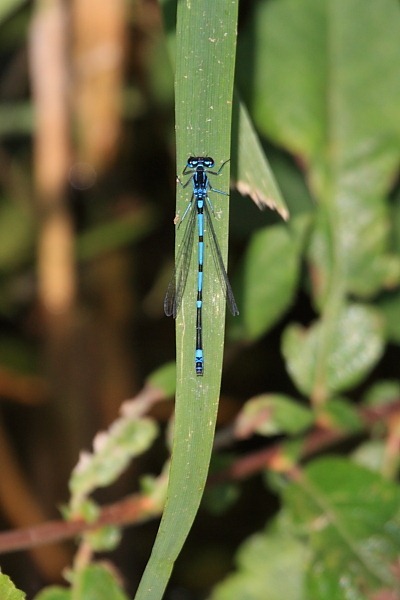 Variable Damselflies do most closely resemble Azure Damselflies, having a similar U-shaped pattern on S2 but they generally also have distinctive antehumeral stripes that are broken, almost like exclamation marks. One of these shots shows that to very good effect. I snapped away becoming more convinced that this was my heart’s desire – well, today’s, anyway. I couldn’t believe our luck. We saw but one “blue dam” (actually, I think were two individuals with slightly different markings) and it was just what I wanted. Well done hawk-eyes and thank you blue dam. New species for the catalogue. Now that’s got to be worth £7.99 – plus lunch!